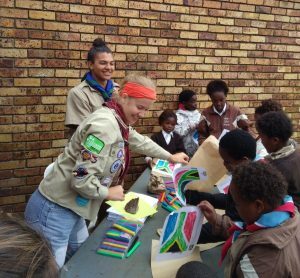 Early 2017 the Western Cape Scout Region initiated the pilot project “Scouting in Schools” which has given around 50 young adults the chance to enhance their skills and change the lives of children through their activities with Scouts and Cubs in Schools. From January to July there were monthly intakes of new interns who received the training and then made their own individual way through the programme. 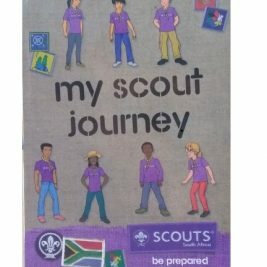 Their journeys began with an introduction camp and the Introduction to Adult Leadership course through which they learnt about the history, values, method and content of the Scouting programme. Soon thereafter they were sent to a school to start their own Pack or Troop as an after school programme. In total over 1200 kids in 27 different schools benefited from this project. We spoke to the interns about the impact this programme had on their lives and that of the schools they served. “It has made a huge impact in the schools. The kids do not want the year to end”, Ayanda says. 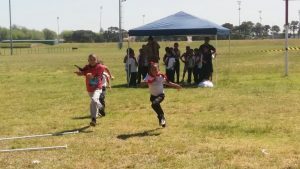 “The programme also helped the children to focus on their studies and not to waste time on stupid things. In communities youth are often busy with negative things, which wastes their time. This programme has changed their life”, adds Siphokazi. 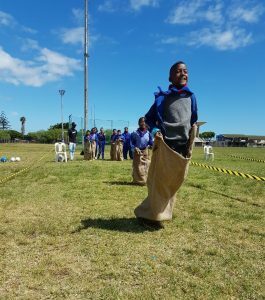 In addition to their Scouting programmes in schools, the interns had the chance to participate in various Scouting events such as the Gordon’s Shield competition or the Kontiki rafting event. 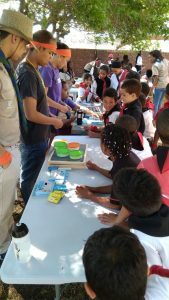 They took part in courses and attended meetings in their host Groups. So did the programme influence the lives of the young adults? The answer is unanimously yes, it definitely influenced the lives of the participating interns. “It has taught me to be responsible and to chase my dreams irrespective of obstacles in the way”, Anelisa says. “At first I was a shy person but now I can proudly stand in front of other people and I learned never to give up no matter what the situation is”, Phumezile tells us. “The project changed the way I judged people’s behaviours and attitudes. I no longer take my role as an individual/leader very lightly as many people depend on and look up to me”, Sandiswa explains. Over this year they all tried a lot of new things and were pushed out of their comfort zone. “I had to face my fear of having to speak in front of an assembly at school. I would say that this was my best experience because I could face my fear and overcome it at the same time”, Bongani says. “I would never admit that I was wrong before this programme”, Wardah adds. They have come a long way and now their programme comes to an end. Many of them stayed, some left but each and every one can take their new experiences and life skills with them on their journey called life. The interns want to thank everybody that contributed to the success of the programme, most importantly Ahmad Solomon, Nimmy Abrahams, Paddy Milner and the many host Groups and schools supporting them. Most of the interns know what they want to do after they are finished: find a job. “I will be looking for a job using the skills that I have gained from the project”, Sihle says. Some of the others want to go back to school, study, volunteer or continue with the SIS programme. “I want to study teaching or nature conservation”, Reuben tells us. For the year 2018, young adults are welcome join the programme and go on an amazing journey for themselves! Our interns say that it is definitely worth joining “You should join, because it is about a lot of self-searching and helps you to feel confident about yourself”, Sicelo explains. “The programme teaches you a lot about life and how you can overcome certain situations in life with the skills you will gain in this year”, Kyle adds. The biggest benefit is “that you can discover your abilities, strengths and weaknesses, things that contribute to personal growth and development. Getting to know yourself better as a person is the greatest benefit of all”, Dylan says. “The project has made me see that nothing is impossible”, Thembakazi concludes. 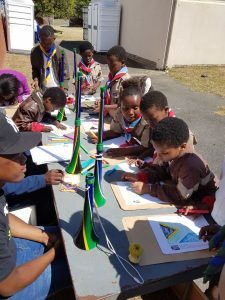 This project is implemented in partnership with the Western Cape Government, After School Game Changer, National Skills Fund, SCOUTS South Africa National Office and the Western Cape Scout Region.